SqD H365 Heavy Duty 400A 600V 3-pole 3-wire Fusible Safety Switch. Nema 1 enclosure. 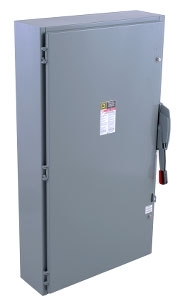 | Gordon Electric Supply, Inc.
SqD H365 Heavy Duty 400A 600V 3-pole 3-wire Fusible Safety Switch. Nema 1 enclosure. Previous SqD H365 Heavy Duty 400A 600V 3-pole 3-wire Fusible Safety Switch. Nema 1 enclosure.